Shields were pieces of men’s essential equipment in the traditional culture and religion of the Plains Indians of North America. They were used from prehistoric times until the turn of the 20th century. Ethnohistorical sources prove that shields were not only used as weaponry accouterments such as armor. They were also used as religious objects. 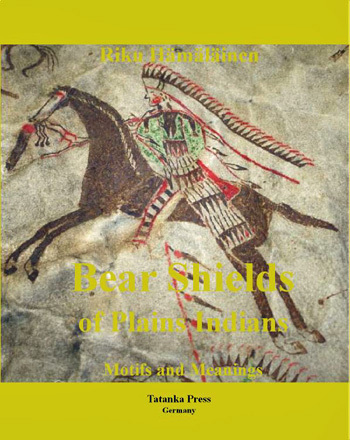 The aim of this study is to examine the Plains Indian shields with bear power motifs and the meaning of the bear as well as to discuss methods for studying these subjects. With the present survey, the internationally known scholar Riku Hämäläinen of the University of Helsinki, Finland increases our knowledge and understanding of the significance of bear symbolism of Plains Indian shields. This volume is the author’s Ph. D. work, a worldwide unique study. Format 10.5x8.5 inches ( (26.5x21 cm). 156 pp. 54 figs. in color + 2 maps. Softbound.